Huawei’s Honor brand announced it’s latest budget Honor Play 8A smartphone in China. It sports a 6-inch HD+ waterdrop notch display with 87% screen-to-body ratio. This phone is powered by the latest MediaTek Helio P35 12nm SoC and runs Android 9.0 (Oreo). It also comes with Face Unlock feature that can scan 1024 facial points, but does not have Fingerprint sensor. It has a 13MP rear camrea with f/1.8 aperture, and an 8MP front camera. It comes with dedicated dual SIM, microSD card slots and packs a 3000mAh battery. The mobile sports a 6-inch HD+ 19:5:9 2.5D curved glass display with a resolution of 1560 x 720 pixels. It is powered by 2.3GHz Octa-Core (ARM Cortex A53) MediaTek Helio P35 12nm Processor with 680 MHz IMG PowerVR GE8320 GPU and runs Android 9.0 (Pie) with EMUI 9.0. The device comes with 3GB RAM and 32GB/64GB storage, the storage memory can be expanded up to 512GB with microSD. It has 13MP rear camera with LED flash, f/1.8 aperture and 8MP front-facing camera with f/2.0 aperture. The device supports Dual 4G VoLTE, Wi-Fi 802.11 b/g/n, Bluetooth 4.2, GPS + GLONASS. It has Dual SIM (nano + nano + microSD) and comes with Face Unlock feature, but no Fingerprint sensor. The mobile packs 3000mAh (Typical)/2920mAh (Minimum) battery, it has size measurement of 156.28×73.5×8.0mm and weight is 150g. 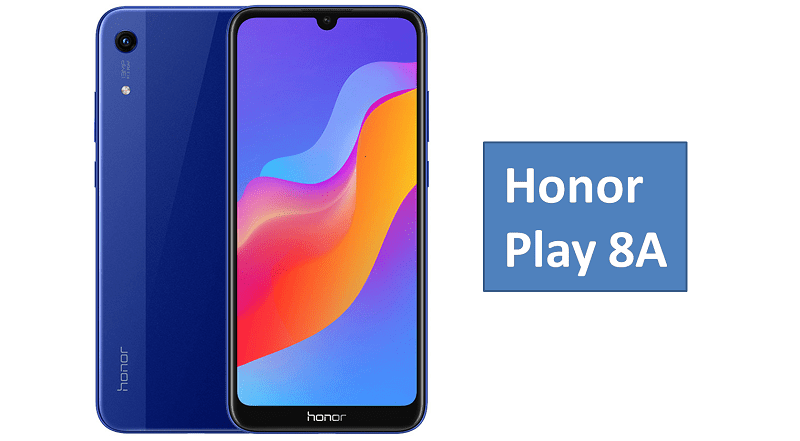 The Honor Play 8A is priced at 799 yuan (US$ 116/Rs. 8,155 approx.) for the 32GB storage version and it costs 999 yuan (US$ 145/Rs. 10,195 approx.) for the 64GB storage version. It comes in Blue, Red, Gold and Black colors. It is on sale in China starting today. Share us your views on Honor Play 8A smartphone in the comments section below.